Playmage Forum • View topic - Dragon Tear enhancements? Update: The new update for Dragon Tear with the super dragon stages should be out in the next few days. Also, regarding the Parrot/Gorilla being powered, we actually found a data bug where the gorilla pet's Devastating Attack's armor piercing is set to 100% instead of 80% that is originally designed to be (note skill description says ignore majority of armor not all armor). This bug will be fixed via server patch when we roll out the new client version, and will cause slight damage reduction for the gorilla pet's skill attack after the patch. Yes i also agree with the guys, this game could use some changes, some animation and sound improvements, it would be cool if there would be 10% of critical strike, on non raged attacks. 5% of dodging a regular attack, 50% parrot calm success rate, and various other balance issues, pulling the pets closer to each other, its easy to find which pets should be balanced, top 5 used should be downgraded, bottom 5 upgraded, for example i rarely see zapbot, mushroom, dog and owl healer used, they could use an upgrade, and foxie lady, kong, parrot, zappie and flurry could use some downgrade. Hey, dont get me wrong, i like them for their devastating power, but its the balance issue. Alao this bug occured several times, i am about to start the fight in a tournament, and the game says "Data error, please restart." And i lose a fighting chance point. Also, why is the dog with spell shield unprotected from foxes fire that is directly caused by a fox, but damaged by a chain reaction that is caused by fire, so indirectly, when a neighbouring pet explodes? Hi P3R0, thanks for the suggestions, if we change the game so drastically it will break the game balance though. Are you playing on Facebook or on your mobile device? Does the shield only protects the pet from magical damage, not from physical damage? My point is it is already unbalanced, even with your previous enhancements, and that is apparent from the number of pets that are mostly used, like the electric stun mushroom, but i said it already, no need to repeat myself. I am sure people will welcome changes since the first complains about the linearity of the game started in 2013, but hey, who am i to analise the game, right? I am playing on a mobile ios. As i said, fox. she deals only magical damage, right? Nobody is mentioning physical damage. Both fire and chain reaction damages are magical, right? I have fox, the opponent has the dog. The fire damages him, with or without magical shield, and isn't reflected back to fox. That would only make sence if she dealt physical damage. And fox is not dealing physical because baby tyro is affected by fire when he puts the physical shield, and there's your bug. 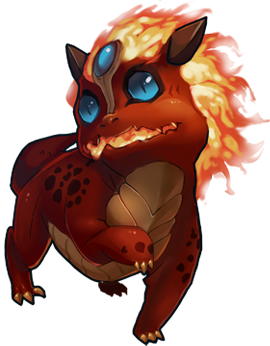 (and as i've already said in other post, the fire animation on baby tyro disappears during this animation, only to return after shield animation, and burn him, minor cosmetic issue). But when the neighbouring pet explodes in different setup of fox, the shield protects the dog from the chain reaction damage and is reflected upon fox. This would make sence if its a magical attack, but since it isnt caused by the fox directly, its weird that direct magical fire damage isnt reflected, and chain reaction is. If you fix this, fox will have at least some counter pet and you will upgrade the dog's rating, fixing 2 issues simultaneously. Also, this forum is dying, is there anything you could do to revive it? Like maybe put a link to it in game? And, it happened more than once, i accidentaly clicked on a wrong npc, could you add a return button so i don't waste 5 energy when missclicking? Even if i just changed my mind, there should be exit battle button. Also, once the food was picked in fight, it can only be changed, never deselected, forcing you to spend food. If you play a game during the training end, the pet being trained is stuck with counter stuck to 00:00:00. Only restarting the app resets it back to normal. Please take some time to look into all of these issues, there are a lot of them in only this one post. I speak in behalf of all those "too lazy to contribute" players. Thank you. Last edited by P3R0 on Mon Nov 09, 2015 4:49 am, edited 1 time in total. Hi P3R0, thanks for the clarification. I will forward it to the team. Hey i just edited the post, please look into it, added more bugs. How can i be informed of the changes that actually took effect? I think just me and Pero are Active in this forum. * Add a Skip Button in Already beaten Dragon stage at Facebook, it would be really really useful! *Make a arena reward for 21~30 and one for 31~40, the reward for 21~30 could be 5 gems and the 31~40 could be 2~3, this would make possible to not experienced player buy his combos, evolutionary items, pet slots, etc. Some of these are excellent suggestions, mate! Lets see if we will get another one of those deas ends, "i will pass it to the team", or they will actually do something. I mean, i dont expect them to shape the game by our requests just because others aren't active, but there are some really good, necessary ideas here, and needed balance changes. I just feel like they dont appreciate our ideas, and we can not make a change. Hopefully they will prove me wrong. Hi Guilherme, thanks for the suggestions. There aren't that many players so arena reward range probably will not be extended. Your opinions will be forwarded but the changes may not be implemented very soon due to lack of human resources as the developers have been working on our new game.